Paweł Głowacki says, on is Delphi Programming blog, “Everybody loves colors. Great apps should use colors in clever and original ways.” It seems that Pawel has been spending a lot of time designing screens for mobile apps in Delphi XE5 and really likes the way that iOS 7 uses the colors and gradients. Pawel takes you under the hood of the FireMonkey graphics architecture showing you how the FireMonkey framework hides the complexity of the underlying graphics APIs and provide an elegant object model to work with the different 3D APIs on different platforms, in much the same way. 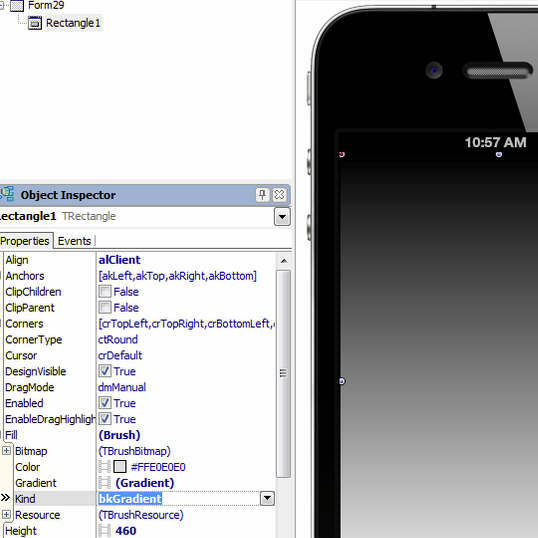 Gradients work on Android, IOS, OSX, and Windows. Stop on over to Pawel’s blog and read his tutorial on FireMonkey Gradients and be sure to download and test out the example code to go with his tutorial.